Critics claim that DCF models rely too much on uncertain predictions about the future, and that they’re too sensitive to minute changes in assumptions for the growth rate into perpetuity. The perception of DCF models has not been helped by their wide use among Wall St. sell side analysts, who will often manipulate the numbers until they can get a price that suits their rating on a stock. We are not using DCF models to predict the future. We use them to quantify the expectations for future cash flows that are baked into stock prices. See how we applied this technique to Netflix (NFLX). Our models are based on economic earnings rather than earnings or operating cash flow. See “Three Reasons Why Amazon’s Cash Flow Is No Comfort” for reasons why operating cash flow is unreliable. What Is A DCF Model? Let’s take a step back for a moment. Before we dig further into the specifics of the New Constructs DCF model, let’s talk about how a DCF works in general. Fundamentally, a DCF functions on the premise that stocks can be valued in the same way as bonds, the only difference being that the inputs for stock valuation are based on expectations whereas the inputs for bond valuations are mostly contractually defined. See Figure 1 for an explanation of how elements of stock valuation line up with those for bonds. By breaking cash flow expectations down into these discrete drivers, we can reverse engineer and quantify exactly what kind of future cash flows the market price of a stock implies a company will generate. What Is A “Dynamic” or "Reverse" DCF Model? Our DCF models do not rely on static forecast horizons such as 5 or 10 years as do traditional DCF models. Our models are dynamic, which means we calculate multiple DCF values for the stock based on multiple forecast horizons. The key to this approach is a terminal value in each forecast horizon that assumes zero growth (e.g. NOPAT/WACC not WACC-g) after the forecast horizon. 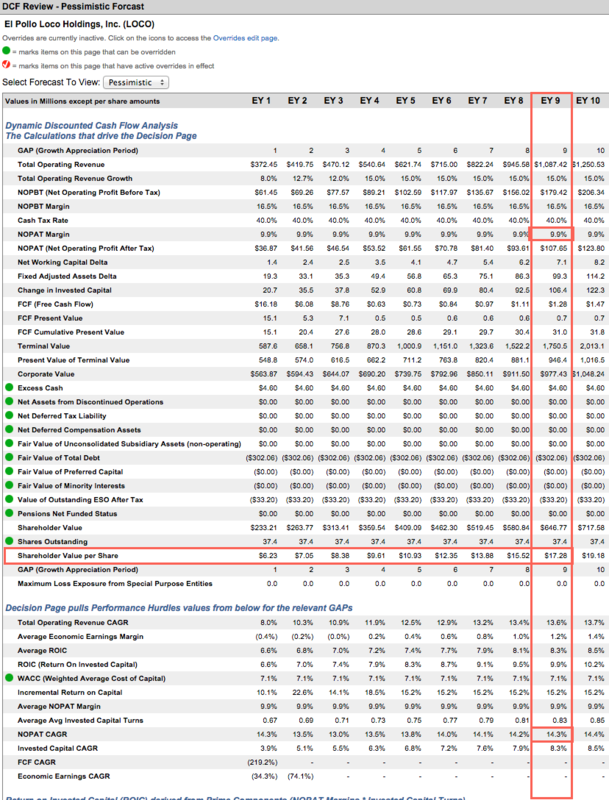 Rather than trying to capture all the future growth in cash flows in a static time frame (e.g. 5 years), our models calculate the value attributable to shareholders over 100 forecast periods. Here’s the list of the forecasting inputs for our models and how we derive our default estimates. Note that all of our models enable clients to change these inputs and create (and compare) as many future cash flow scenarios as they wish. Revenue growth is the easiest of all the estimates. We like to rely on consensus values for the first few years. Then, we tend to converge back to historical averages. From EY51-100, most of the time we assume a growth rate of 6% for all companies. We converge most companies to 6% over the long term because that is roughly the long-term geometric GDP growth rate since 1929. These assumptions are only a baseline, and can be adjusted as needed. Forecasted revenue growth should not be 6% if a company has never generated 6% growth, and our analysts make this adjustment in our forecasts. Also, revenue growth is rarely below 3% since the historical average annual inflation rate in the US is 3%. Margin forecasts tend to be based on historical averages where they make sense. We prefer not to forecast significant deviations from what the company has done in the past. Also, the NOPBT margin forecasts tend not to change across the entire forecast period. This consistency simplifies measurement of the impact of differing margin level assumptions. We cannot use consensus values for our margin forecasts because our margin calculations take into account a great deal more data than is used in most analysts’ models. See details on our income statement adjustments. Tax rate forecasts tend to be based on historical averages also. Like the margin forecast, tax rate forecasts tend not to change across the entire forecast period in our default scenarios. By applying the cash operating tax rate to NOPBT, we get Net Operating Profit After Tax (NOPAT). To measure free cash flow, we must forecast how Invested Capital changes. We break out the invested Capital forecasts into changes for net working capital and fixed assets. By forecasting the change in cash operating profits and the change in invested capital, we get both free cash flow and Return On Invested Capital (ROIC). The inputs above create a future stream of cash flows that we must discounted to their present to account for the opportunity cost of capital. We use the weighted-average cost of capital (WACC) to discount cash flows in each company model. Our WACC is based on standard formulas for calculating the cost of debt (risk-free rate plus a spread based on credit rating) and equity (CAPM). The inputs above create a future stream of cash flows that are discounted to their present value value over multiple forecast horizons. 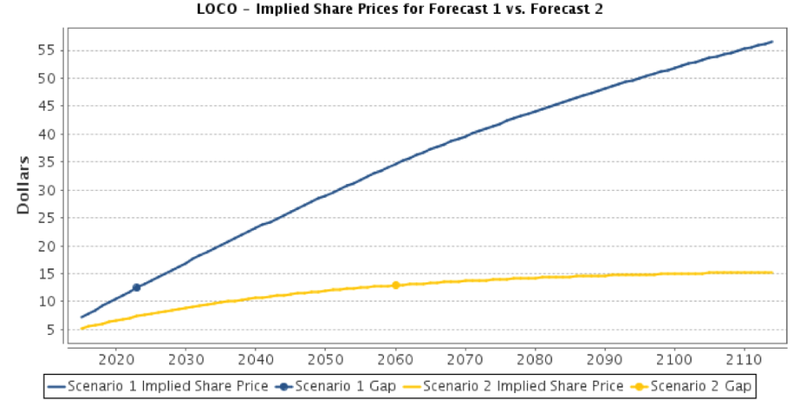 The GAP equals the forecast horizon (or number of years into the future) required for the dynamic DCF model to produce a share value equal to the market price or a target price. The key benefit of the reverse DCF model is that it allows us to reverse engineer the forecast horizon for future cash flow growth implied by a stock price. Rather than use the DCF model to predict what the price should be, we use it to flush out the specific future cash flow expectations implied by the current market price. This approach is based on the Competitive Advantage Period (CAP) concept for DCF modeling. As mentioned above, the key to this approach is using a terminal value that assumes zero growth into perpetuity in each of the 100 years captured in the forecast horizons of each of our DCF models. Our terminal value calculation is NOPATt+1/WACC. For an example of how our reverse DCF model quantifies market expectations, check out the Danger Zone article from March 23, 2015 on El Pollo Loco. In that article, we pointed out a number of red flags that made the stock one to stay away from, but the biggest area of concern was the massive future cash flow expectations baked into the stock price. Specifically, our DCF model found that the company had to grow NOPAT by 20% for 9 years to justify its price at the time of ~$29/share. Essentially, the company had to become the next Chipotle despite not stacking up to the fast casual Mexican chain in terms of same store sales growth, increase in store count, or ROIC. By quantifying the expectations embedded in the stock price as of March 23, 2015, we were able to get a sense of just how unlikely it was that LOCO would deliver positive returns to investors. We also ran a new DCF with more realistic—but still optimistic—expectations that delivered a fair value 37% below the stock price at the time. Turns out we were too optimistic. In the roughly six months following that article, shares of LOCO plummeted 52% as the market realized just how overvalued the stock had been. Now trading at just over $13/share, the stock has more reasonable growth expectations baked into its valuation. Figure 2 comes from our model for LOCO. The neutral scenario shows that, to justify the current price of $13/share, the company must achieve 5.6% revenue growth and a 1.2% economic earnings margin over the next 9 years. Those expectations are what the current stock price implies. We still rate the stock as Unattractive due to its poor earnings quality. Given LOCO’s declining ROIC and disappointing growth in recent quarters, investors might have a hard time believing the company will achieve the performance implied by even the current price. In which case, they should continue to sell the stock and not buy until market expectations are so low that they are confident the company will surpass them. To orient ourselves to the new lower valuation, we create the “Pessimistic” scenario to measure the impact on the valuation of a lower growth, 3% annually, and a slight decline in margins. Our model shows that the Pessimistic scenario results in a GAP of 46 years. The implications of 3% revenue growth as a future scenario are impactful, to say the least. Looking at multiple scenarios informs us of the specific implications of different future cash flow scenarios on a stock’s valuation. Our models enable clients to quickly and discreetly model the impacts of an infinite number of future cash flow scenarios on over 3000 stocks. We aim to bring a new level of efficiency to valuation research. Looking at the DCF 6 months ago showed us that LOCO was highly overvalued unless it started growing at a rate well above its historical norms. 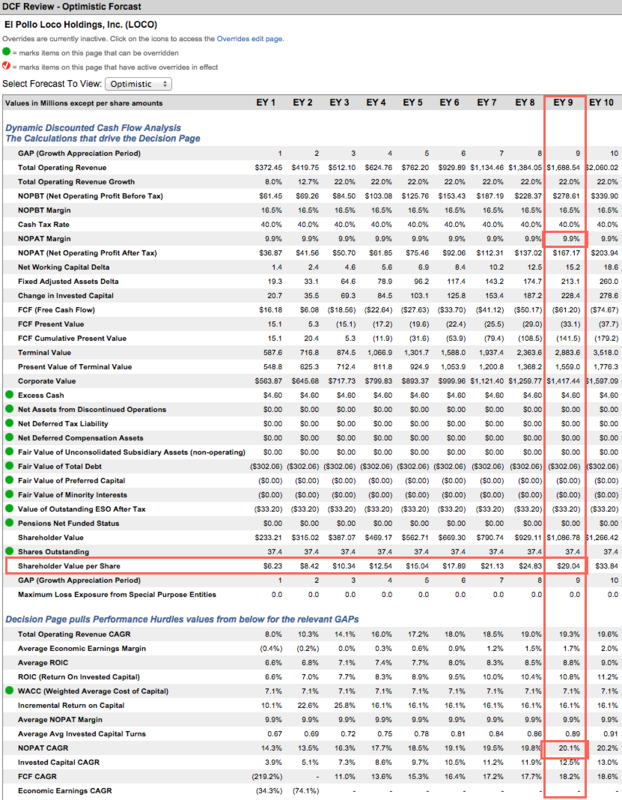 Looking at the DCF today gives us a new perspective about the cash flow expectations embedded in the stock price. We think our DCF models offer uniquely powerful transparency into the valuation of stocks. With our models, there’s no need to rely on traditional valuation metrics like price-to-earnings and price-to-sale ratios when investors can get the information our models provide in the same or less time that it takes to calculate the traditional metrics. “Buy low expectations and sell high expectations” – that strategy is what our models position clients to execute with unrivalled efficiency.